Medicines management: is it a disciplinary offence to leave the drug trolley open when unattended? Lock medicines away or risk disciplinary action, advises Matt Griffiths. All medicines should be locked away in a treatment room, drug trolley or the patient’s bedside locker. If you are doing a drug round on the ward and have to leave the trolley unattended for any reason, it is vital that you lock it. Many hospital wards have patients with dementia and there have been cases of confused patients ingesting medication not meant for them, with fatal consequences. There may also be patients on the ward who self-harm or have suicidal thoughts, or who abuse medication. Intravenous fluids are often overlooked as medicines requiring safe storage; these still need to be kept locked, as there have been incidents where IV fluids have been tampered with. The only medicines that should not be kept under lock and key are resuscitation drugs, which need to be easily accessible in emergencies. These should be kept in tamper-evident containers and checked daily. If you think they have been tampered with, report your concerns immediately. The Duthie Report on the safe handling of medicines supports this stance. Originally published by The Royal Pharmaceutical Society of Great Britain in 1988, the report was updated in 2005 and is currently going through another review. It is vital that all medicines are kept safe and secure to protect patients, so talk to your line manager or area pharmacist if you need extra storage space or solutions. 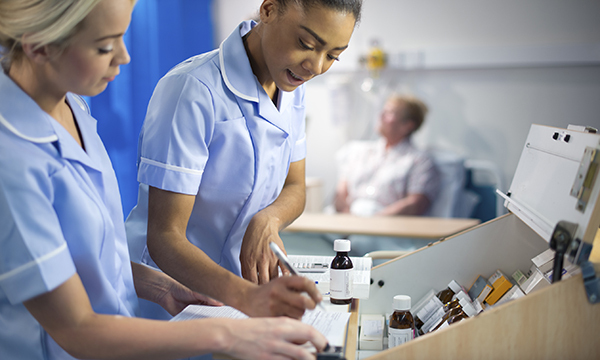 If you fail to store medicines safely, you risk breaching standards set out in the Nursing and Midwifery Council code. You could also be in breach of your employer’s policies and procedures, which could result in disciplinary action.